This Instant Pot Cauliflower Soup is the best cauliflower soup I have ever had. It is rich, creamy, and delicious and has all of the comforting flavors of a loaded baked potato. You have the option of adding unlimited toppings for even more flavors just to your taste. The Cauliflower Soup recipe is made in a pressure cooker so it is quick and easy to make and packed full of flavor without a lot of time or fuss. This soup is perfect for kids and adults both since the soup is rich, creamy and delicious and the extra flavors you add as toppings so each person can pick what they want for extra flavors. This is one of those recipes that is. JUST.SO.GOOD. 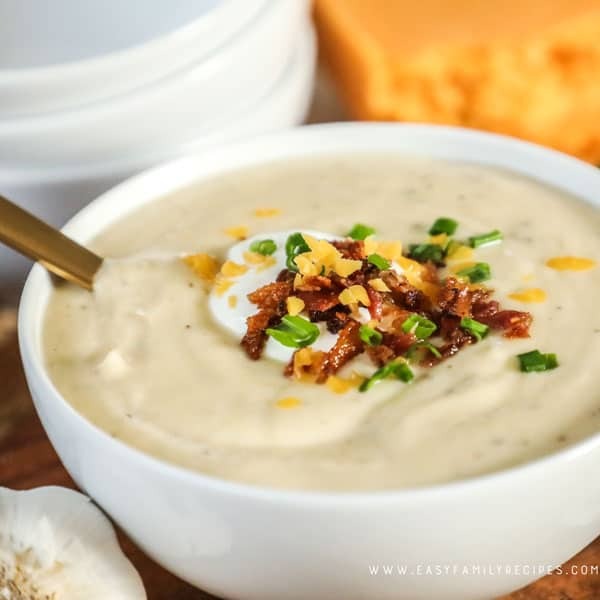 Baked potato soup is probably one of the all time yummy comfort foods and this has all of those same delicious rich flavors but is completely made with cauliflower instead of potatoes which gives you tons wholesome veggies loaded in there! Most recipes I test out 2-3 times before I get it right, but this Creamy Cauliflower Soup was so good on the first try that I have made it several times since and not changed a thing! I have been loving my Instant Pot lately, and even though we got off to a slow start, I am using it several times a week now to make meals. You just can’t beat the quick and easy convenience and simple clean up. This Instant Pot Cauliflower soup is no exception. There is no extra steps in this recipe, just dump in the main ingredients, cook, then blend it all together with the cheese. The result? Velvety smooth, perfectly creamy, and tastefully rich soup. If you don’t have an Instant Pot, you can find a crock pot version of this Loaded Cauliflower Soup here! The real fun of this Instant Pot Cauliflower Soup recipe comes in serving it with all of the toppings. My family loves to eat this with little bowls of all of the toppings on the table so that each person can make their own custom bowl with as much or as little of each topping as they want. Since the soup is rich and creamy but has a pretty neutral flavor, you can get as traditional or as crazy with the toppings as you want and it almost always works out completely deliciously, so you can serve it with just traditional baked potato toppings, or get a little crazy for more excitement at the dinner table. As you can see the toppings are really only limited by your imagination! You can go traditional, go with another theme like Mexican, Italian, or Barbecue or just put a little of everything out and get creative. This soup is super quick and easy to make. I have a full printable recipe card at the bottom of this post for complete instructions, but I will walk you through some of my tips and tricks here so that if you have any questions, hopefully they will be answered. If you still have questions, feel free to drop them in the comments below! What spices do I need for the Cauliflower Soup? This recipe uses garlic, salt and pepper to flavor the soup. There is what may seem like a lot of garlic in the recipe, but once it cooks the flavor mellows to really compliment the flavor. You can adjust the salt and pepper to your preference if desired. 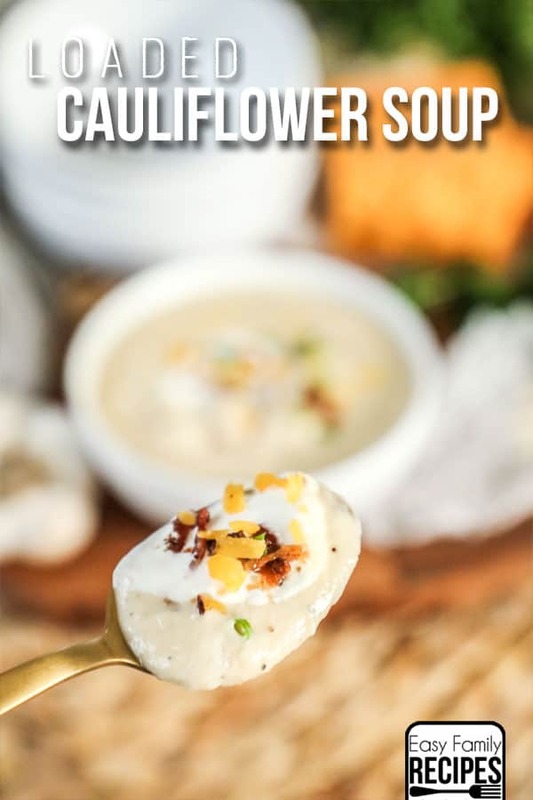 This cauliflower soup has a great neutral flavor that while still really amazing on it’s own, allows you to add toppings like bacon, cheese and green onion to give it a little something extra. How do I make the Cauliflower Soup creamy? We will use an immersion blender and cream cheese to make the soup creamy. When the cauliflower is blended with the broth and liquid released in cooking and then the cream cheese is blended in, it makes the soup the perfect thickness and perfectly smooth and creamy. I use an immersion blender to blend the soup, but if you don’t have one you can transfer the soup to a blender or food processor to blend it. The cream cheese not only helps to make the soup creamy but also adds a depth of flavor and richness to the soup. How do I make the Cauliflower Soup thicker? I think if you follow the recipe you will end up with the perfect thickness for the soup, however if you want your soup thicker, you can reduce the broth by 1/2 cup before or after cooking, but before blending. This will help the soup to reach a thicker consistency. If you want the soup to be thinner you can add additional broth, or add milk to the soup during blending until the desired consistency is reached. If you have special needs or dietary restrictions, this recipe could be a good option. Gluten Free- This soup is naturally gluten free. Toppings listed may not be gluten free so make sure to check labels. Dairy Free- This soup is not dairy free and has no easy substitutions for this need, but if you are looking for a dairy free cauliflower soup, try this Whole30 Roasted Cauliflower Soup recipe. It is delicious! Low Carb- This recipe is generally considered low carb and friendly for keto and macro counting diets. Please see nutrition label for specific information. Vegetarian- Instant Pot Cauliflower soup can be made vegetarian if you substitute vegetable broth for chicken broth, however some of the toppings listed are not. This Instant Pot Creamy Cauliflower Soup is velvety smooth, perfectly creamy, and rich and full of flavor. It is a one step recipe made in the pressure cooker, it is quick and easy to make and ready to serve in no time. The best part of this recipe is loading it up with all the toppings so make sure to have plenty! Chop the cauliflower in to roughly even smaller pieces. Add the cauliflower, garlic, chopped onion, chicken broth, salt and pepper to the pot of the Instant Pot. Cook on high pressure for 8 minutes. Quick release the pressure, open the pot and add the cream cheese and cheddar. Use an immersion blender to blend the soup until smooth. Serve hot and garnish with your favorite toppings. Enjoy! Store leftover soup in an airtight container in the refrigerator for up to a week, or in the freezer for up to three months. This recipe is naturally gluten free*, low carb, and friendly for low carb and keto diets. *Guten free- The soup is gluten free, however some topping suggestions listed may contain gluten. Check ingredients to confirm gluten exclusion. Are whole garlic cloves used, or are they minced? I use whole garlic cloves because once they are cooked they will be super soft and blend right into the cauliflower so that you just get the flavor. Hi Lori! You can use a crock pot instead. Find my full recipe for making Cauliflower Soup in a crock pot here! I just made this and it’s great, however I’m wondering where the olive oil in the ingredient’s photo comes into play. I don’t see it in the recipe. Hi Connie- Sorry that was confusing. I was photographing multiple recipes that day and I think it was just an oversight since the other roasted cauliflower soup recipe I did had it in the ingredients. Sorry about the confusion. I added it to the Instant Pot with all the other stuff. Olive oil’s good for you anyway. I’m addicted to this soup. Made it last week on the stove and thought, “this has got to be easier in the IP!” It is much easier! Thanx for the recipe..
Just made for dinner! SOO GOOD! I might add some baby spinach to mine and smoked paprika. Thanks! Sorry Erin- That was a mistake, I am not a nutrition expert but do my best. Unfortunately the calculator I used had an error on salt but I got it fixed. Thanks for bringing my attention to it! Very good! I used a head of cauliflower and 3 potatoes and it was a great flavor. I’m sure I could use just cauliflower, but I had potatoes so I added them. I did a test version and will be making it again for an office ‘soup’ party on the first Friday of Lent. I’m just going to sub vegetable stock for chicken stock. Thanks for the great recipe! Those sound like some great ideas for the soup. Glad you enjoyed it and I hope it is a hit for the party! This is the soup recipe I’ve been waiting for – a remake of Zupa’s Wisconsin Cauliflower Cheese soup. I used a little more broth, but otherwise stayed true to the recipe. Absolutely love it, making it for the second time today – thanks for sharing it. Thanks so much for your kind words! We liked it so much we made it a few times in a row too. Also, it freezes well so you can make a big batch and freeze for a later date when you need a quick dinner. I was hoping this would be a Zupas copycat! I am buying the ingredients today for my Instant Pot! Is it a big deal if you don’t have an Emerson blender? Not at all! You can transfer it to a blender or food processor if you want it super smooth or just use a potato masher if you don’t mind it a little chunky. I made this today and it is absolutely delicious – and so easy. It will be in my regular rotation from now on. So glad to hear you enjoyed it. We sure do love this soup. You can also double the recipe and put it in the freezer for an easy meal another day. So glad you enjoyed it. That come to pressure time is tricky especially since it can vary based on the temperature of your ingredients, the amount of liquid in the recipe, and your altitude and climate. I’m excited to make the cauliflower soup. And would like to see more recipes. Please contact me on E Mail. Thanks. I hope you enjoy it! 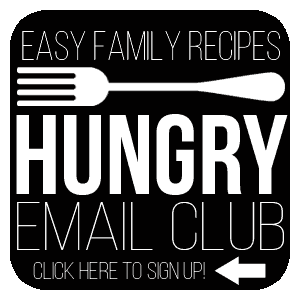 You can sign up to get my e-mails by clicking the button above. Happy cooking! Just made this. It is very good but I think next time I will do 3/4 of the cream cheese.. Seen a to be over powering to me for some reason(and I really like cream cheese. Great otherwise! I had a head of cauliflower and made this soup with a few adjustments. I added some potatoes, cut the amounts of cheeses and broth. Great way to have a quick homemade lunch. Thanks for the recipe. I am planning on making this soup today. I would like to mention that you say this recipe is vegetarian, but you are using chicken broth. You do say to substitute for vegetable broth if you are vegan, but even vegetarians wouldn’t use chicken broth. I do find people don’t consider broth “meat” and therefore will say something is vegetarian when it’s not. Just made this tonight for dinner in my IP and it is so delicious!! I could have sworn I was eating potato cheese soup! I topped it with cheddar cheese, bacon and green onions! I just loved this soup. Thank you for posting the recipe and all your topping tips., it made a great meal. HI- I have made this many times and it it delicious! I plan to double the recipe this week. Are there any changes to the cooking time it I double the ingredients? This looks amazing..will be making for lunch on this cold April day. Thanks for the easy directions. Cheers! Hi Shannon- This is actually also my site! I don’t often post the same recipes, but when they are extra good like this one I sometimes do! Thanks for the heads up! Do adjustments to instapot need to be made if I double the recipe? Great recipe. My family loved it. We will be making it again soon. Just made this. It’s soooooooo good! Really creamy and flavorful. So easy. Followed directions exactly – except – I let the pressure release naturally for 6 minutes before I release the remaining pressure. Only because I forgot to do the instant release! Very very good. Thanks so much! My daughter just started Keto and is coming this weekend – I found this recipe and just made it. She’s not a huge fan of soup but my husband and I are and we LOVE it! Hopefully I will turn her into a soup lover with this recipe. Definitely a keeper, keto or not! Yummy!!!! Next time I’d cut the garlic to 3 cloves and cut the cream cheese in half at least. Together, they left a first-bite impression of eating hot, garlicky Cheez Whiz. This despite the fact that I’m a big fan of both garlic and cream cheese. It’s two hours later and I keep chuckling to myself as I catch myself grimacing and sticking my tongue out of my mouth, trying to escape the overwhelming flavor of garlic. Way, way too much. Can I substitute ricotta cheese for cream cheese? How do you think it will affect the taste and texture? I typically don’t comment on things, but I wanted to take a moment to say thank you for posting this. I am very much enjoying it! This recipe is amazing! I made it after my wisdom teeth were removed. I bumped the pressure time to 12 just to make sure everything was properly mushy and it came out well. So glad you enjoyed it! I hope that you feel better soon! Will the soup be as good if I don’t add the cheddar cheese? I love it but forgot to buy it. What cook time would you recommend if I double the recipe? I made this on my second night of owning and cooking with my Instant Pot. I served it topped with Yum Yum chicken recipe from Jennifer Robbins’ Affordable Paleo Cooking with your Instant Pot. I omitted the salt in both recipes because I used Imagine Organic chicken broth instead of my own home broth and it had plenty of sodium. I believe it will become a family favorite. I’m not sure why but my (teen and tween) kids didn’t want to eat it until they knew what it was. To me it looked appetizing, but they claimed it didn’t look like they expected. When told it was cauliflower soup, they were very excited to eat it and admitted it tasted great! That’s awesome! Its always a win when you can get your teens to eat veggies! It wasn’t too garlicky. It wasn’t too cream cheesey. It was amazing!!! The easiest soup I’ve ever made. Thank you! How long would you recommend for frozen cauliflower? We loved it!!! Making it again this weekend! My husband can’t get enough of it! I did use 3 cups of chicken broth instead of 2 cups. It was fantastic!!! New Instant Pot owner here – this was incredibly delicious AND so easy – I loved that I could put everything in without having to saute the onions first. Thanks for the recipe! I just made it today and it was quick and easy. Was so delicious! I added celery to mine and extra cheese. So yummy! I made this recipe today exactly as written. This is the best tasting cauliflower soup I have ever tasted!,,, Thank you soooooo much!!! I made this tonight in my IP blender and it was wonderful! I added the cream cheese and pulsed and it was so rich and creamy! Definitely a keeper recipe! Used 1 large head of cauliflower (couldn’t’ weigh). Next time will use 2 heads including the stalk (the IP will soften it all). Just want more of a cauliflower ‘presence’, & the amount of cream cheese can still maintain the creaminess. Served with chopped: bacon, green onions, & tomatoes. Thank you for an unusual, unusually-easy recipe! !